Several Grand Haven classrooms partnered with local businesses, including Automatic Spring Products, in the fall of 2018. This program is called Homegrown. Students are presented a challenge facing their partnered business, and it’s up to students to develop a possible solution. 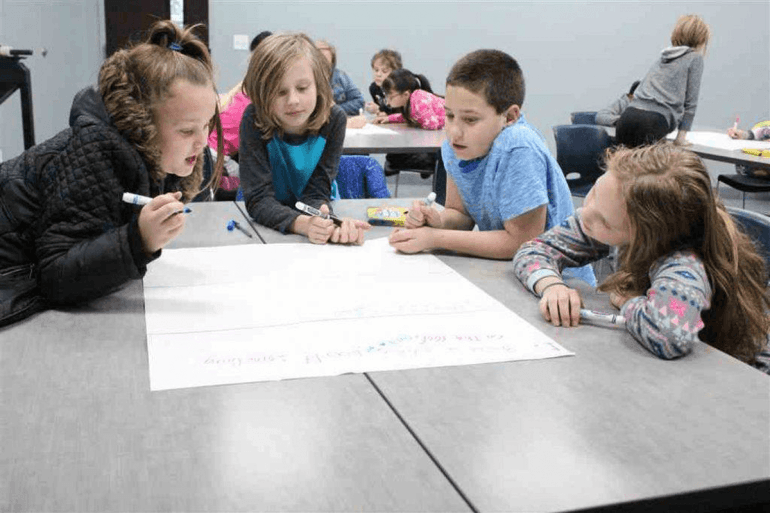 The program takes several classrooms of grades K-4 through a design-thinking process. Teacher Nick Tejchma’s fourth graders are one of the classes partnering with ASPC. Boxes currently occupy the space that will soon be used for a new machine. After their first meeting, students created an empathy map to understand what employees might think, feel, hear and say. Students asked employees questions to gather more information before they develop final solutions. Once students developed solutions, they presented to the employees and received feedback. After that they presented their ideas to the business leaders, parents and the community during a showcase event. Fourth grader Tasia Payne said she thinks it’s good they’re partnering with the ASPC. The program has also gained attention in the West Michigan region because it’s a partnership with K-4 and business as opposed to working with high school students. Rhonda Gibson, training manager for ASPC, said they got involved with the program as part of an outreach o understand curriculum in schools. “It’s been a pretty dynamic process,” she said.